A few years ago I happened across a craigslist post for items being sold from a 1950s house that was going to be demolished. I got five screen doors and all the hardware, and dragged them home and stored them. I wanted to use the widest one on our front entry, but it didn't swing the right way, and it would have looked butchered up if I had tried to change it around to make it open the other way. 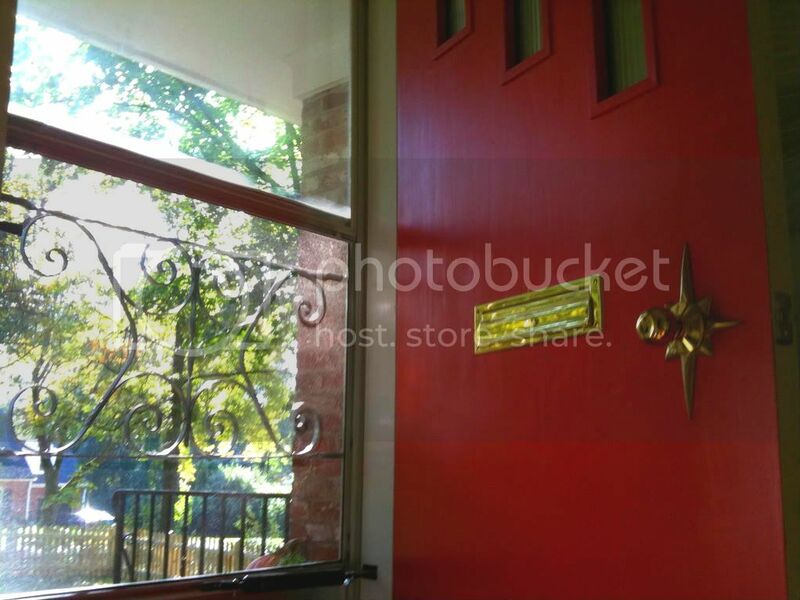 Luckily after some googling I found a source online for new aluminum screen doors with mill finish (not painted). They look a lot like the old mid century aluminum screen doors you used to see on lots of houses, but the quality is not as good. The doors probably weigh about half of what the old doors do. They're not as strong or substantial. But at least you can still find them. And since they are available from a chain hardware store, you can order the size and swing direction you need and have it delivered free to your closest hardware store so you can pick it up locally and save on shipping. After I installed the new door in our front entry, I transplanted one of the scroll-work guards (or grilles, or grills, or grates, pick your favorite term). It really gave the door a finished and vintage look. It looks good, don't you think? I like giving something like this a second life. 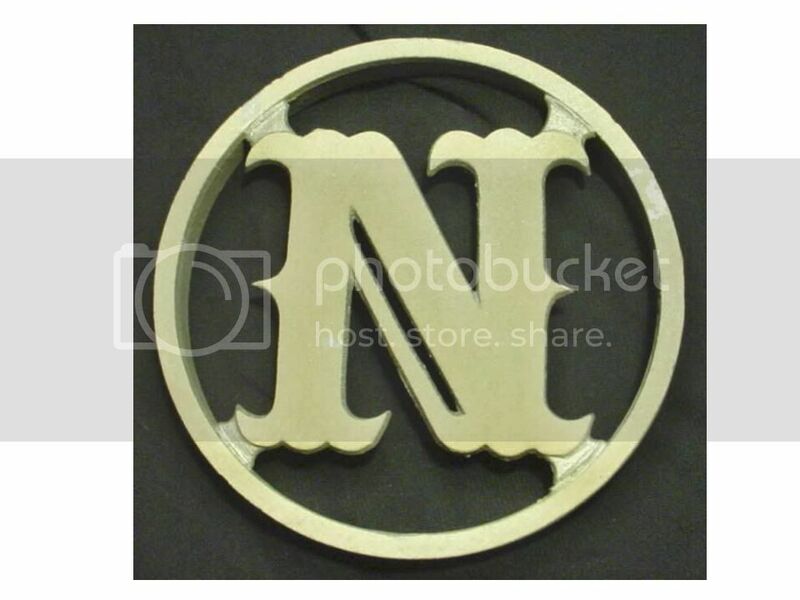 Sometimes you can find a monogram letter or a grille on ebay, but as far as I can tell, you can't even buy a new monogram letter in the right style. 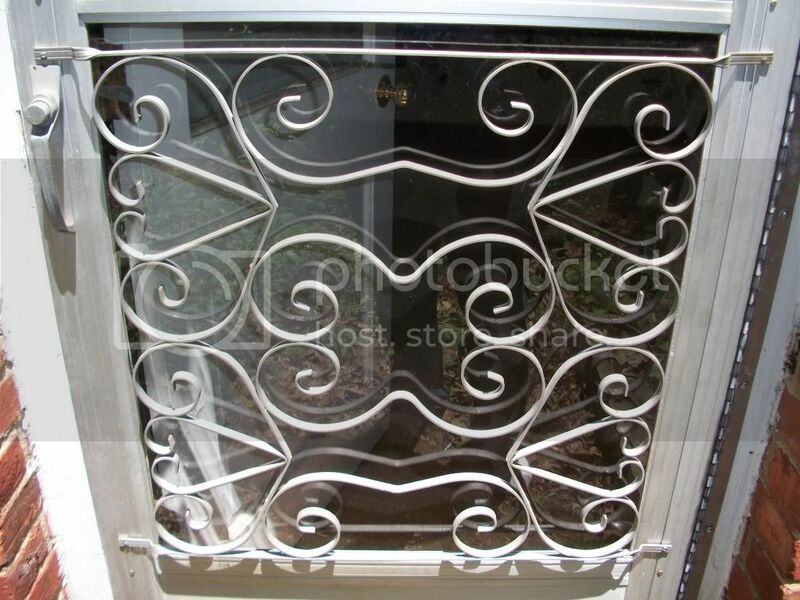 Sadly, I cannot find a single source for these screen door/storm door grilles/guards/grates. Tried every search term in Google, and found nothing. I'd love to see this stuff available new. If you luck into something you can afford, you still have to be sure the width and height are correct for the door you want to use it on. This one is on ebay right now. Another one on ebay right now. There's one business that makes decorative grates that are a lot bigger than the ones on my doors. They look like they're made to go on a modern full window storm door, and they're a heckuva lot more expensive than I'm willing to pay too. I think there's a market out there for these screen doors and decorative guards, just as there's a market for mid century doors. What do you think? I agree with you completely! We have a custom made screen door on our porch but it has no protection from our pets trying to go through the already sagging screen. I have been scouring antique shows and websites trying to find something interesting but no luck. If you find anything, please let me know. 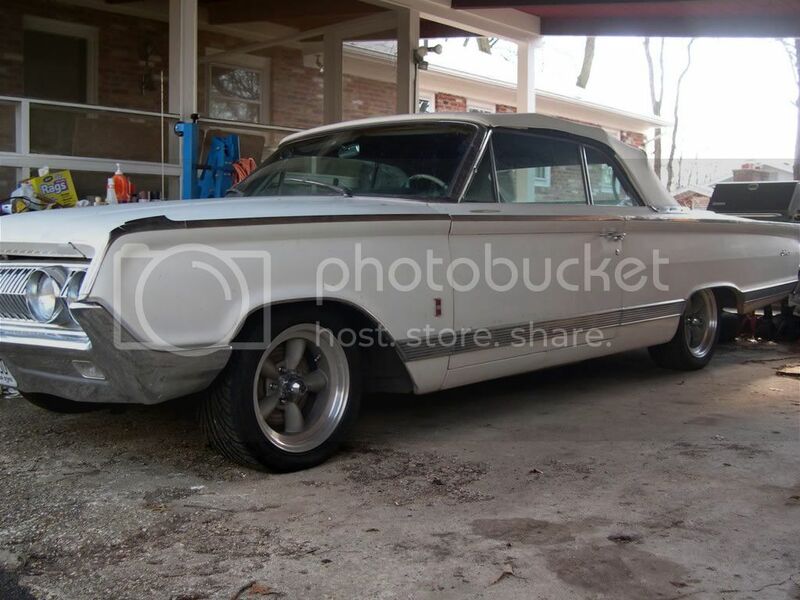 I think its safe to say "They just don't make em like they used to!" 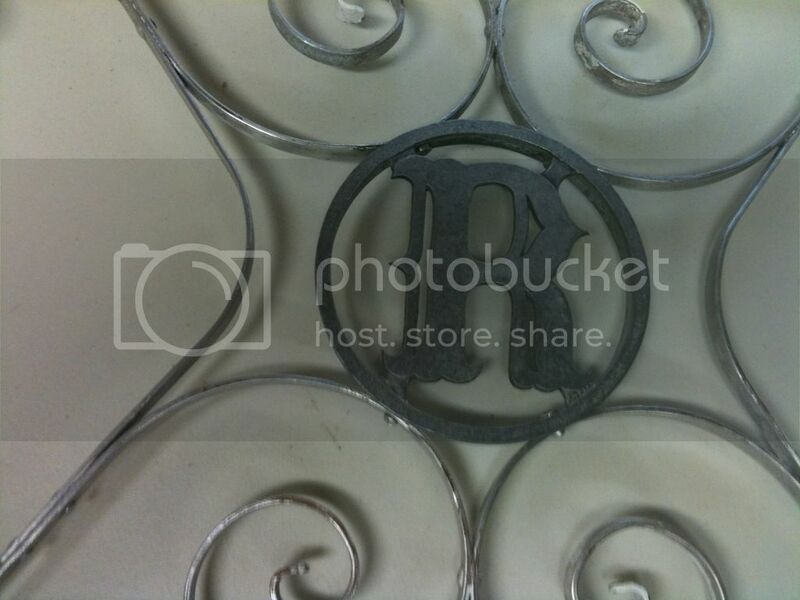 I love the idea of having your initial on the gate, if I ever see an "R" its all yours! This is another one of those "why don't I get the raw materials and teach myself how to bend and rivet the stuff together. How hard could it be?" LOL. The simple curved turns wouldn't be too hard, but making a tool or jig to get complex twists would be harder. And making my own monogram letters or cast figures of sheep or donkeys or chimpanzees or Dodge Darts would take a lot of artistry. I've got a couple books on doing your own aluminum casting, and I will probably give that a try one of these days, but even then you have to have a prototype to make a mold from. For now I'm content to rant and rave about the injustice of not being able to buy these darn grates new anymore. But I will try not to rant on this blog unless it's for the common good. Otherwise it comes across as whining, don't you think? I've been watching eBay for a year, have seen an S and an A but that's it. I recommend saving searches on eBay and you'll get email notifications when new things are listed. I'm still struggling with what to do with the R - I bought another guard but it turned out to be a couple inches too narrow for our front door and the existing guard would have to be cut/modified and I don't want to cut it. A local hardware store near where I work still sells these. If you are interested I can forward you this information. Thanks for the offer Anonymous, please do forward me the information! I need to add that I contacted brett who posted above, but I was too late and the full set of monogram letters is no longer available. And I have not heard back from Anonymous June 18 8:06 am above. If I do get more information on these letters I'll blog about it. I've got a 6" 'G' available, and am looking for a same size 'V' if anyone has one. what did you use on ebay for searching for these letters? Nice find on Etsy, Bob. 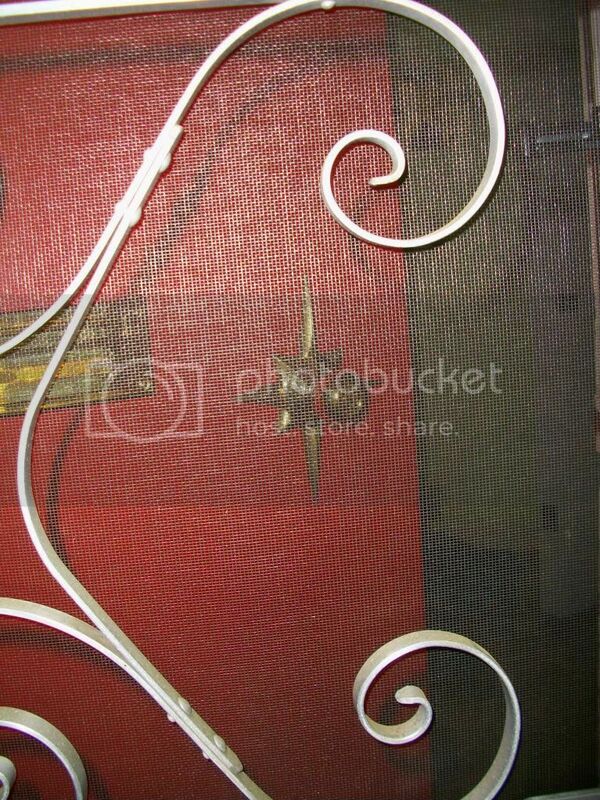 I have a couple of saved searches on ebay - Vintage screen door, and Vintage aluminum door. I get a lot of junk, but sometimes a letter or grill will pop up. If you want me to email you if I find a V, just email me (see the About Me section above). That goes for anyone else reading this. I am happy to maintain a Wanted list and if I find a letter I can email you - just contact me via email with your needs. hey there i recently found 2 alum.storm door grills.one has the initial J and the other plain.each are in Chicagoland if anyone is interested email me at blchannell45 at gmail .. 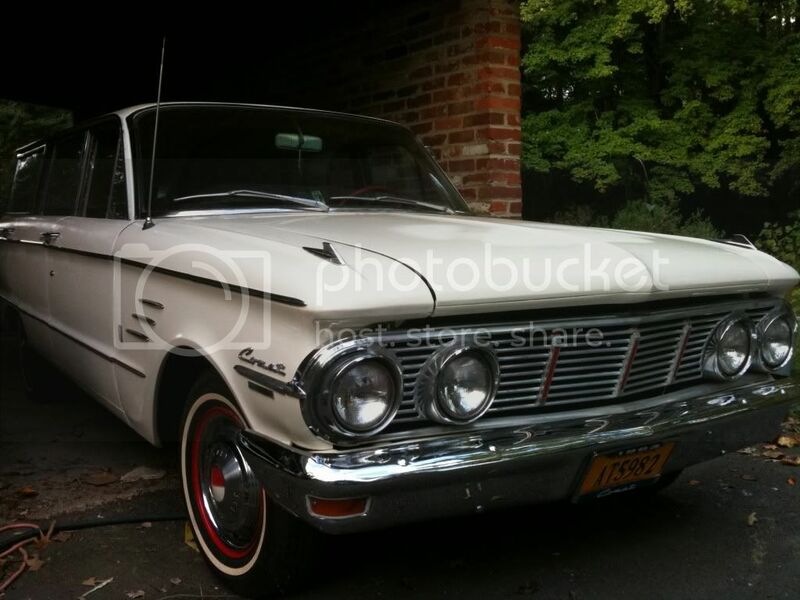 I need an S and can then give a V.
I have a W and would trade it for a D.
I always liked the Vintage Aluminum Screen Doors with Monogram Letters in the Grille Guards.But I don't have one. I pulled 2 "R"S off my Grandma's old house in Tennessee, but keeping one and giving one to my sister or mom, as a memento. Her house is abandoned now, but we still have good memories! I have an aluminum door on my '48 house. I took it off because I thought it was hideous...I wanted to show off my cool door. But it was cold this winter without it and it'd be nice to have it this summer for the screen. 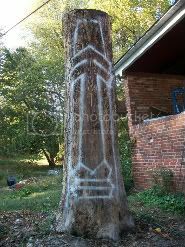 I want to spray paint it. Anyone tried this? Good or bad results? 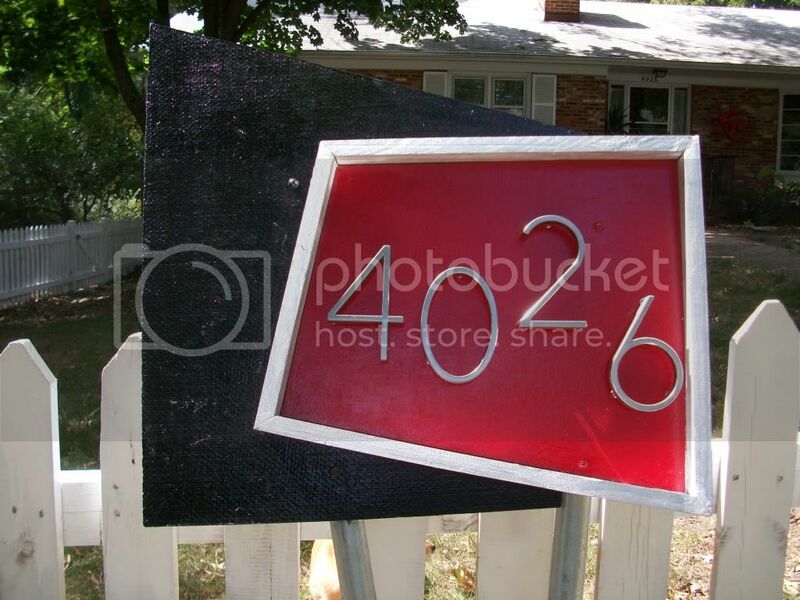 I'm hoping my vintage screen porch will be revamped soon and I can finally install the fabulous egret screen door grille I found on eBay (think it was yours, Uncle A). I thought I paid too much for it, but have not seen anything like it so have switched to patting myself on the back for snapping it up. Can't wait to see how it looks. I will post a pic of it when it's up. Thanks Jessica. Sadly, no, I haven't found any source for newly made grills. I recommend checking out estate sales in old neighborhoods. 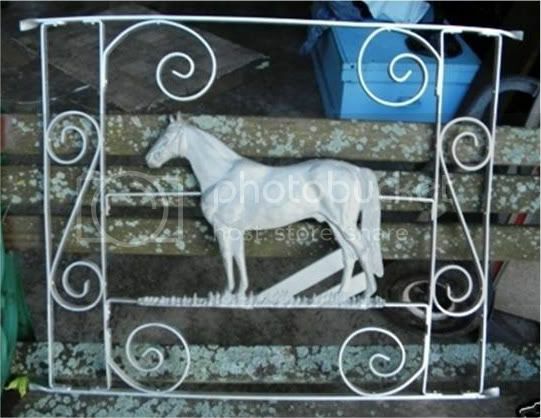 Sometimes you can find these in garages or storage areas and even in gardens, repurposed to hold vines. Good luck with your search. I do see both the letters and the grills on eBay from time to time. Try checking here http://www.doorandgrille.com . I have also been looking for these. 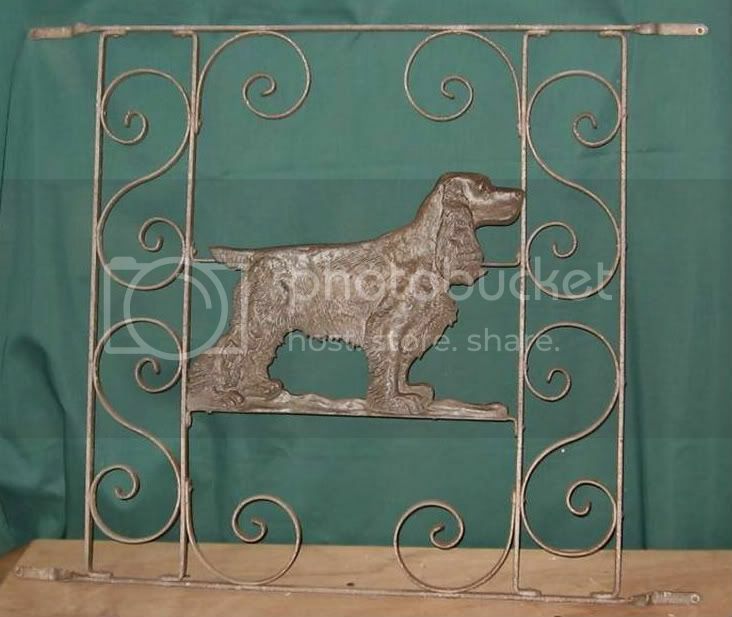 I would love to find a complete grille with a D or G - preferably a G. I want to use it as a decorative fireplace grill. Thanks. Please respond to denisediehl1031@yahoo.com with any suggestions. Thanks. I saw a couple doors out by the road for free on my way to town this morn. One was a sceen door with aluminum grille. I bought a small screwdriver at the grocery and when I came back an elderly woman was putting the garbage out there. I stopped across the road and looked at the doors for a minute. Then I waved to her, made a U-turn and stopped and asked if she would mind if I took the grille off since the whole door wouldn't fit in my car. She said she didn't mind! I had to work to get that little tiny screwdriver to turn those screws out, but I got it! It has an F, which was what I needed, and why I made the extra effort to get it. I also have a T grille at home that I got for 10 cents! I just like them, something from childhood. They also fit windows but I'd like to find more ideas for repurposing them. anyone have a "c" they would like to get rid of. 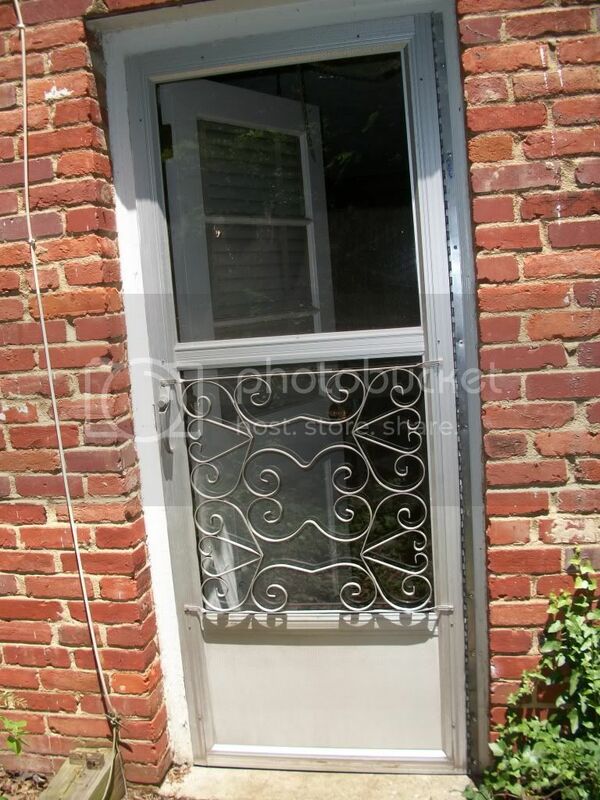 Just installed a screen door that I a weathering and would like to have a vintage aluminum guard for aesthetic value. Would really prefer the flying ducks that I remember on my grandmothers house. Thought these would be so easy to find online. Boy, was I wrong!!!!! !